Providing more comfort, color and quality. Manufactured to exacting standards with luxurious velour material and individually tufted. Adds color and comfort to your piano or organ bench. 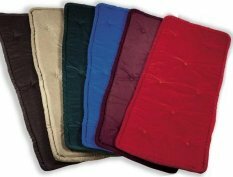 Polyurethane foam padding is 1" thick for extra comfort. Easily attaches to bench with 3 tie strings...completely reversible. Because of our special design with classic rolled edge, length and width measurement of bench need not be as exacting as with other bench pads. One inch plus or minus in length or width will still provide a suitable fitting bench pad. See color samples below . . . NOTE: Light Blue has been discontinued.